Drinking beer, making chips, feeling O-K-ale! Finals week… prelims… blurk. 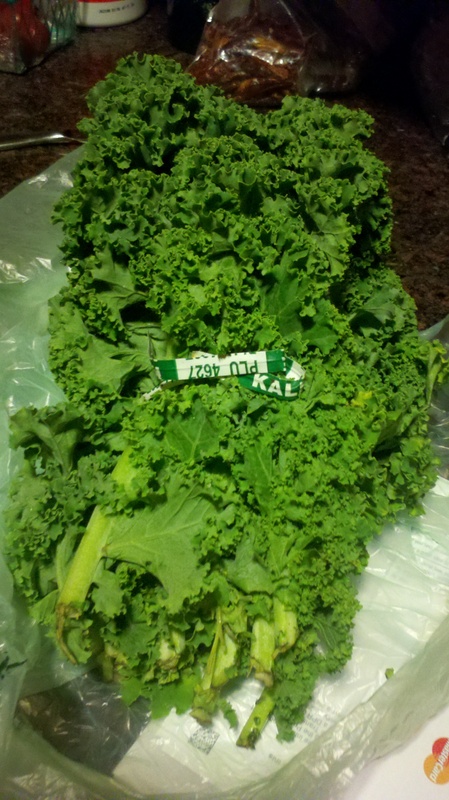 Chop up your kale into 1 inch or so size pieces, like chips. This is a recipe where I actually believe in preheating, rare. 400. I bet hobbits would love this stuff: Bilbo BaGgins would totally dig it. He has this recipe in the bag. Throw your kale, a tablespoon of olive oil or two (I ran out and added some vegetable oil), and a healthy splash of balsamic into a plastic or ziploc bag. 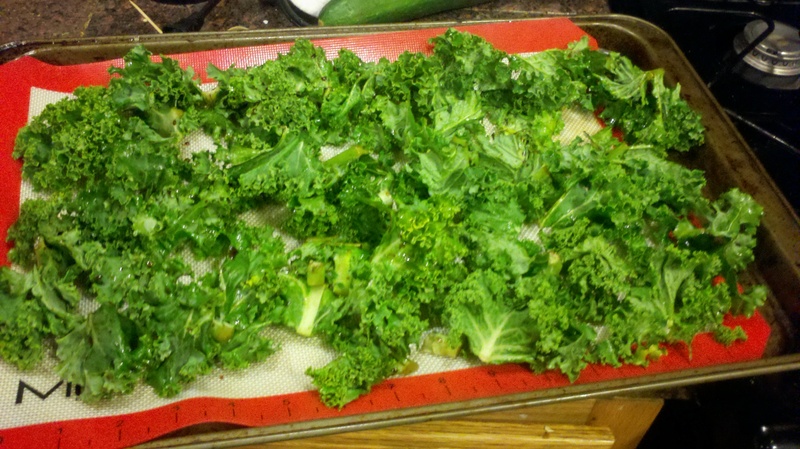 Squish it around so all the kale gets covered, and then spread it out on your baking sheet. No one would feel green with envy of this baking sheet. Unless you love hanging out in 400 degree ovens. Bake it and WATCH IT LIKE A HAWK. 5-10 minutes. This goes from perfectly crisp to horribly burned in about 30 seconds. How long you cook is your preference, but I like it when the whole chip looks dry and the edges are lightly browned. 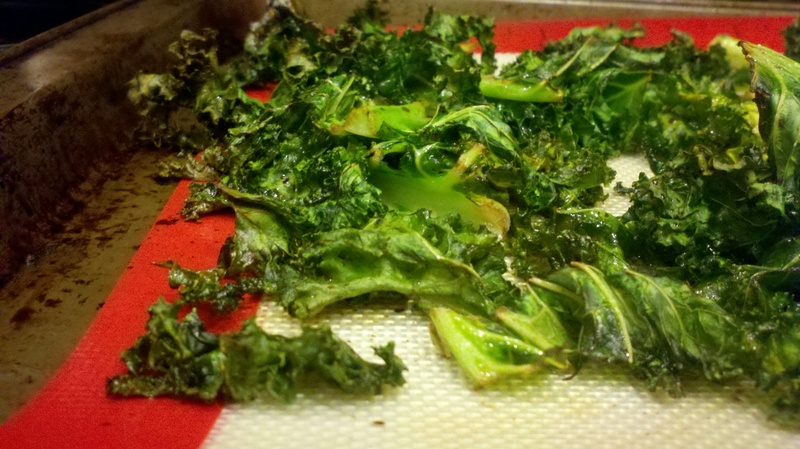 Kale chips: turning your frown upside brown! So delicious, addictive, and slightly healthier than potato chips! 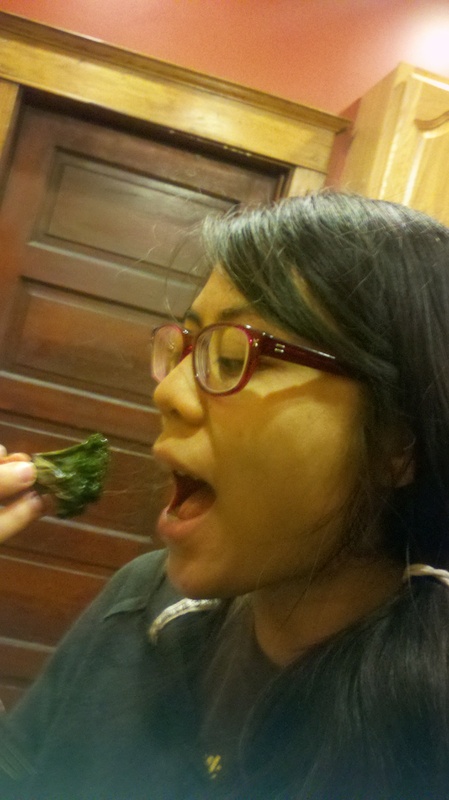 I can eat a whole head of kale this way in about 5 minutes. Spread out on a baking sheet for 8-10 minutes or until as crisp as you like. Sprinkle with salt and eat! Great recipe! I used your approach tonight, and not having any experience in cooking (baking?) stuff, I think it was a success. 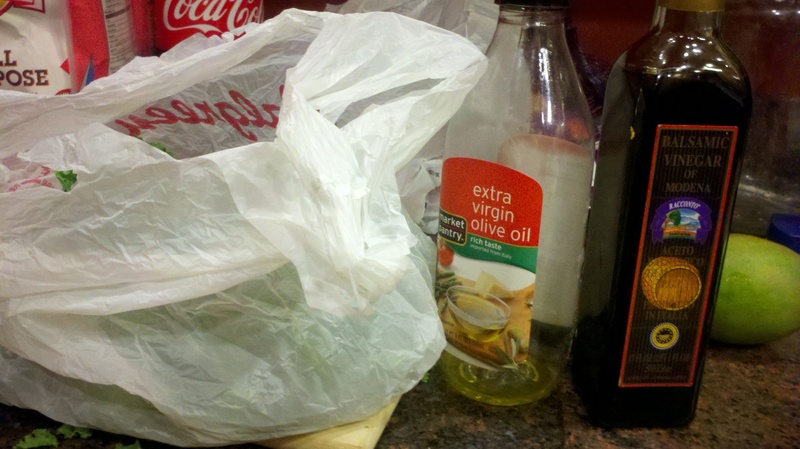 I did not have any balsamic vinegar, but that didn’t seem to change much. Also, I found the perfect time in my oven to be closer to 13 minutes (although I did take it out twice to check the crispiness, and I might have a less powerful oven). Further, the kale turned out better if I let it sit for about 20 minutes to dry, after washing with water and sprinkling with olive oil, before putting it in the oven (the first batch was partly soggy, even after 13 minutes). Overall, I think the chips turned out quite well, but you’ll have to be the judge of that.